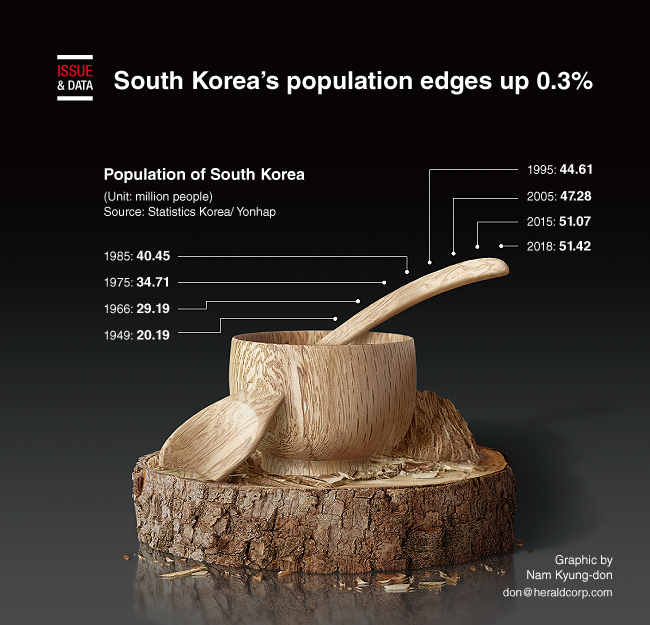 South Korea’s total population rose slightly last year, but elderly people continued to outnumber children amid a rapid aging trend and a record-low birthrate, a national census showed. A total of 51.42 million people were living in South Korea as of Nov. 1, 2017, up 0.3 percent, or 150,000, from a year earlier, according to the 2017 census by Statistics Korea. The latest annual tally showed the country’s economically active population falling for the first time. The agency started to hold a census based on national resident registration records every year from 2016, with the conventional person-to-person survey to be conducted every five years. Out of the total, the number of South Korean nationals reached 49.94 million, while foreign residents who stayed in the country for at least three months totaled 1.48 million, accounting for 2.9 percent.